Nicole Kidman and Meryl Streep joined forces. Source: Getty. They star as mother and daughter-in-law in the new series of Big Little Lies, and it seems the close bond between Meryl Streep and Nicole Kidman extends far beyond their roles on the TV series. 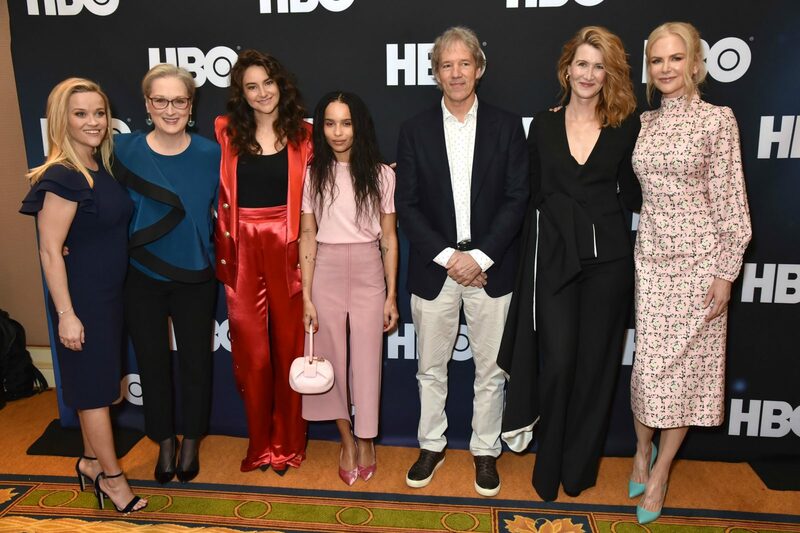 The stars joined forces alongside their co-stars Reese Witherspoon, Laura Dern, Zoe Kravitz and Shailene Woodley, at the 2019 Winter Television Critics Association, putting on a stunning joint display as they took to the stage to discuss the show. Nicole, 51, stood out in a pretty light pink floral dress which fell to just below her knees and offered some vintage style with a high collar and long, flared sleeves. The stars of Big Little Lies joined forces for the event. Source: Getty. The actress added some vibrant colour to her look with some stand-out green heels and wore her hair tied back in a loose do. Meanwhile, Meryl, 69, showed off timeless elegance in some smart black trousers and a blue blouse with a statement bow-style attachment across the front. She too wore her blonde hair tied back and flashed a beaming smile as she laughed and fooled around with Nicole on stage. The stars are close friends away from the show. Source: Getty. Meanwhile, Laura, 51, looked super stylish in a low-cut black jumpsuit, while Reese, 42, opted for a classy navy blue knee-length dress. Adding some bright colour to the mix, Shailene, 27, stood out in a bright red jacket and matching metallic flared trousers, while Zoe, 30, matched in her own cut-off flared trousers but instead went for a light pink theme. Meryl completely transformed for her role in the second series of the hit TV show, as she plays Mary Louise Wright, the mother of Alexander Skarsgard’s character Perry, and mother-in-law to Nicole’s Celeste. Celeste was the victim of horrific domestic violence in the first series, before it ended with her on-screen husband’s death – which became central to the entire series as viewers tried to guess who had killed him. Nicole and Meryl joined the producers on stage. Source: Getty. In a first photo from the second series, released several months ago, Meryl looked youthful with brown hair and minimal make-up. The photo, shared by Nicole and her co-star and friend Reese on social media, shows Meryl sat down on the floor peering at a screen, with Nicole and her two on-screen sons cuddled up next to her. Wearing pyjamas and a dressing gown with glasses on, Meryl looks completely at home and pulls off the casual look well. Meanwhile, Nicole is still fully dressed in the snap in some casual jeans and a shirt, as she shows off her on-screen brown hair. Are you a fan of Big Little Lies? Do you like their outfits at the reunion?